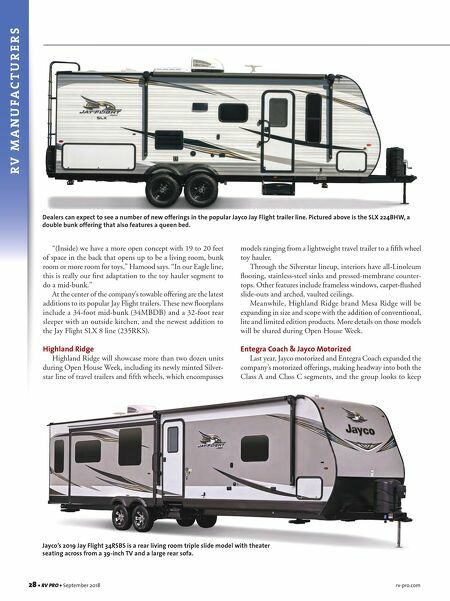 rv-pro.com September 2018 • RV PRO • 29 that momentum rolling this year by exhibiting several new-look floorplans alongside a handful of new products. Combined, those developments should give Jayco's motorized segment its most robust offering to date, according to Ryan Eash, a director of motorized product development. "We're super excited to be adding some new floorplans to an already good core offering," he says. "Just through four different product lines we're going to have nine or 10 brand new floorplans." For its part, Entegra will exhibit several first and second-year motorhomes as it continues to dial in its growing gas-powered Class A fleet. Specifically, the RV maker is adding to the Vision and Emblem lines with the goal of making the company's offerings "well-rounded," Eash says. "We've got an entry-level E450 (Vision) and we've got a higher-level E450 (Emblem), and it's super important to be hit- ting the Sprinter business, and that's why we've got the Qwest," he says. "We've come out with the Emblem, which is really a high-end Class A with a lot of the same amenities you'll see with higher-end coaches." The gas-powered Emblem and the Vision are both intended to deliver the amenities of high-end Class A diesel motorhomes, but at a lower price. Each is built on the Ford F53 chassis and powered by a 6.8-liter Triton 10-cylinder engine accompanied by a 6-speed automatic transmission. "We feel it's really important to take on that core stuff and have a good group of floorplans and try to get really good at what we're doing before we come out with 14 floorplans," Eash says. The other big news from Entegra is the launch of the Reatta luxury diesel pusher, which the company officials first unveiled in July at the Family Motor coach Association's International Convention in Gillette, Wyo. The 37-foot Reatta is built on the Spartan K1 raised-rail chassis featuring independent front suspension (not offered on similar coaches by competitors) and a Cummins 360-horsepower engine. The coach is equipped with Bilstein shocks, designed to provide it with best-in-class ride and handling. 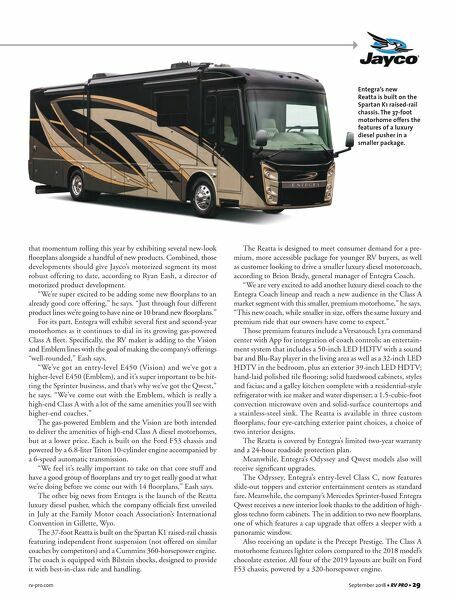 The Reatta is designed to meet consumer demand for a pre- mium, more accessible package for younger RV buyers, as well as customer looking to drive a smaller luxury diesel motorcoach, according to Brion Brady, general manager of Entegra Coach. "We are very excited to add another luxury diesel coach to the Entegra Coach lineup and reach a new audience in the Class A market segment with this smaller, premium motorhome," he says. "This new coach, while smaller in size, offers the same luxury and premium ride that our owners have come to expect." Those premium features include a Versatouch Lyra command center with App for integration of coach controls; an entertain- ment system that includes a 50-inch LED HDTV with a sound bar and Blu-Ray player in the living area as well as a 32-inch LED HDTV in the bedroom, plus an exterior 39-inch LED HDTV; hand-laid polished tile flooring; solid hardwood cabinets, styles and facias; and a galley kitchen complete with a residential-style refrigerator with ice maker and water dispenser; a 1.5-cubic-foot convection microwave oven and solid-surface countertops and a stainless-steel sink. The Reatta is available in three custom floorplans, four eye-catching exterior paint choices, a choice of two interior designs. The Reatta is covered by Entegra's limited two-year warranty and a 24-hour roadside protection plan. Meanwhile, Entegra's Odyssey and Qwest models also will receive significant upgrades. The Odyssey, Entegra's entry-level Class C, now features slide-out toppers and exterior entertainment centers as standard fare. Meanwhile, the company's Mercedes Sprinter-based Entegra Qwest receives a new interior look thanks to the addition of high- gloss techno form cabinets. The in addition to two new floorplans, one of which features a cap upgrade that offers a sleeper with a panoramic window. Also receiving an update is the Precept Prestige. The Class A motorhome features lighter colors compared to the 2018 model's chocolate exterior. All four of the 2019 layouts are built on Ford F53 chassis, powered by a 320-horsepower engine. Entegra's new Reatta is built on the Spartan K1 raised-rail chassis. The 37-foot motorhome offers the features of a luxury diesel pusher in a smaller package.